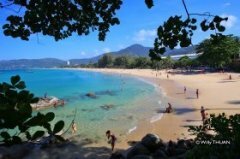 Karon Beach is the second longest beach in Phuket but the third in beach popularity. 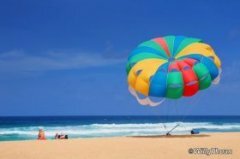 Karon enjoys a very wide stretch of white sand with a decent choice of dining and nightlife, yet it never seems to draw crowds of tourists (which might actually be a good thing). The beach is also known to make a fun squishy sound when walking on the sand. 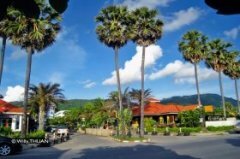 Karon is divided in three areas: Karon Center, the Lake and the Beachfront Road. 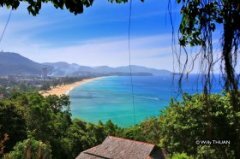 Two great hotels right on the beach you should consider if the price is right for you: Beyond Resort Karon and Centara Grand Beach Resort Phuket. Two other resorts with good ratings just with a street to cross to reach the beach (with lots of sea view rooms) are Mövenpick Resort & Spa Karon Beach and Hilton Phuket Arcadia Resort & Spa. Then you have a myriad of smaller hotels all around the place, you shouldn’t have a problem to find accommodation according to your budget. For something a little more upmarket is a nice semi outdoor space, have a look at El Gaucho inside Mövenpick Resort. Probably the best view in Karon is On The Rocks near the stadium. 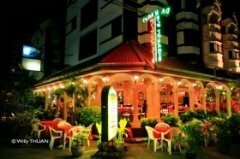 More casual is EAT Bar & Grill Restaurant and for seafood you can choose a real restaurant by the lake called Mama or one of the many seafood stalls by the street that are actually cheaper and a lot of fun. For comfort international food, Two Chefs and Karon Cafe are very popular. Angus O’Tool is also a long time Irish pub and the area is full of tiny beer bars such as Clapton Bar, and a small ‘Soi Bangla‘ type or alley. Nothing really exciting, but the place is very lively. Patak Road is mostly a street going perpendicularly inland from the very fancy and convoluted ‘Karon Circle’ to the temple. It’s small, messy and feels rather old and additionally parking there is impossible. Around here you will find few long-established restaurants, convenience stores and ‘Hellooooo you want massage‘ parlors and lots and lots of bars in all sizes and shapes. Just like everyone else, walk up and down Patak road and pick one bar, ultimately they are all ‘same same but different‘. The Lake near the circle has also been the subject of many attempts to make the area an upmarket zone or even a convention center. Once in a while it hosts a local fun fair which it’s fun, fair and crowded, but ultimately not really upmarket. The beachfront road goes all the way from the lake to Kata Beach and is mostly occupied by massive resorts with few small hotels squeezed between. 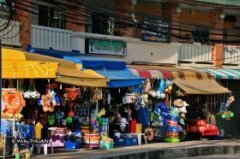 At the beginning of the beach road you’ll find Karon Beach Square, the Night Bazaar, a temporary roofed market selling mostly tee-shirts and beach toys, including all the usual fake brands. More interesting is Soi Aroonson, a small street in the middle of the beach road. Some good restaurants have opened here as well as lots of massage and few convenience shops. It’s still a bit quiet, but doesn’t feel as messy as Karon Center. 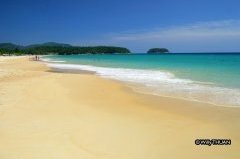 Then you’ll reach the end of the Beach Road, when a small hill leads to Kata Beach (boundaries have never been very clear). Noticeable around here is the restaurant really built on the beach, a football stadium (also used for cricket competitions) and one of the two nightlife areas around. This very narrow and hard to spot ‘Soi’ (an alley) is called ‘Bangla Plaza‘ and has always been here, but nothing to compare with in Patong Beach nightlife. Not much more than few beer bars with colorful spotlights and even more colorful staff. Plenty of tiny shops and foot massage as well. 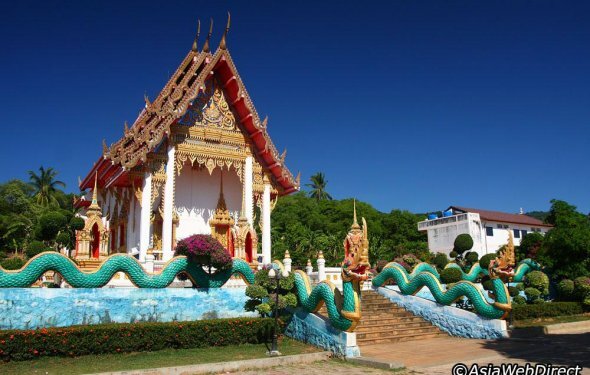 Karon Beach Temple at the end on Soi Patak is nice and often has local fun fairs and the popular Karon Temple Market. Never miss a chance to visit these, they are full of photo opportunities and fun thing to try, games to play and fun local food to buy (You might not want to eat, but I bet you’ll want to take a photo).